The Subaru brand is getting awards all over the globe and the all-wheel-drive 2013 Outback is getting its fourth future value award in Canada. Subaru's 2013 Outback sport utility wagon gets another global award by winning the 2013 Canadian Black Book Best Retained Value Award in the mid-size car segment. The 2013 Outback is a popular sport utility all-wheel drive wagon in Canada, and it keeps its value better than any other small car in the segment. This marks the fourth year in a row that the Subaru Outback sport utility wagon has claimed a CBB Best Retained Value Award. It’s no surprise that the Outback retains its value as Canadian consumers purchase the sport utility wagon for its all-weather capability. Consumers know that depreciation on a new vehicle is the biggest deterrent to purchasing a new car. Shiro Ohta, president and CEO of Subaru Canada said, "We're thrilled that the Subaru Outback was named a Canadian Black Book Best Retained Value Award winner for 2013. Depreciation is the single greatest cost of vehicle ownership. Winning this award four years in a row will help more and more Canadians consider an Outback when it comes time for their next vehicle." Canadians not only get a vehicle that retains its value, but all-wheel drive comes standard which is a must for the cold Canadian winters. Competitors generally offer all-wheel drive as an extra-cost option, but Subaru offers their Symmetrical All-Wheel Drive as a standard feature on the Outback. The Outback has 8.7 inches of ground clearance, which is higher than many crossovers and even some dedicated SUVs. Subaru offers three different Symmetrical All-Wheel Drive systems for the 2013 Outback. Each comes specifically tailored to the type of transmission. In Outback 2.5i models equipped with the 6-speed manual transmission, the Continuous AWD system uses a viscous-coupling locking center differential to distribute power 50/50 front to rear split. If the car slips at either the front or rear wheels, the system sends more power to the opposite wheels for improved traction on ice and snow. 2013 Outback 2.5i models equipped with the new Lineartronic CVT use Active Torque Split AWD. An electronically managed continuously variable transfer clutch actively controls power distribution in response to driving conditions and wheel slippage. The top range 2013 Outback 3.6R uses the Variable Torque Distribution (VTD) AWD system with a five-speed electronic automatic transmission. The VTD system normally sends more power to the rear wheels (45:55) to enhance handling agility, and it can continuously adjust power distribution in response to driving and road conditions. All three systems are ideal for the Canadian consumer who is driving in extreme winter conditions. 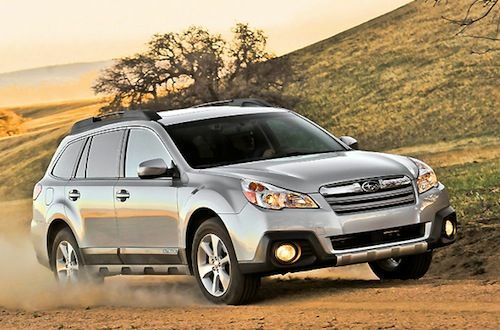 The 2013 Subaru Outback also claims the Canadian ALG Midsize Utility Vehicle award for the third consecutive year. ALG notes that consistently high demand combined with mid-lifecycle improvements enable Subaru to keep incentive and daily rental fleet sales to a minimum. The 2013 Subaru Outback has seen strong sales in Canada and around the globe. Subaru continues to be one of the top automakers in the world and having the highest predicted resale value for the 2013 Subaru Outback will help the brand gain more traction with Canadian buyers this winter.